Directed by Chad Stahelski and written by Derek Kolstad, John Wick: Chapter 2 is the sequel to the 2014 film in which the titular former-hitman being forced to take part in assassination only to get into serious trouble just as he refused to return to the world of crime. It’s a film in which a man who had once gained peace in his life only to be driven back to the dark world of crime is suddenly trying to fight to retain this sense of peace that he has been craving for as Keanu Reeves reprises the role of the titular character. Also starring Common, John Leguizamo, Riccardo Scamarcio, Ruby Rose, Ian McShane, and Laurence Fishburne. John Wick: Chapter 2 is a gritty and evocative film from Chad Stahelski. The film follows the titular character who has just gotten revenge from the people who had lured him back into the world of crime as he hopes not to return until a crime boss asks him to do an impossible assignment as part of a blood oath Wick made many years ago. Wick initially refuses until his house was destroyed as he is forced to do the assignment as it relates to a person being coroneted to a high seat of crime lords in the hope he can’t do anything else ever again. Yet, the assignment proves to be tricky and challenging where it’s the aftermath that is more troubling as it play into the rules of what Wick has to live by. Derek Kolstad’s screenplay showcases Wick’s reluctance to return to the underworld as all he wants to do is live peacefully as he would make that deal with another crime lord earlier in the film who is related to the people that wronged him in the previous film. Yet, that peace would be brief all because of the crime boss Santino D’Antonio (Riccardo Scamarcio) who gives Wick a marker that reminds him of the blood oath Wick makes. One of the two rules that Wick has to live by is to never turn down a marker and the other is no killing at any hotels known as the Continental as it’s forbidden in the criminal underworld. Wick has already violated one rule in private as he is forced to do the assassination for D’Antonio as it relates to a seat in this high council of criminal bosses. For everything that Wick has to do in this assignment in Rome, he also has to deal with other hitmen wanting to kill him including a boss’ loyal bodyguard in Cassian (Common) whom Wick has a mutual sense of respect for. When he returns to New York City to seek the help of another crime lord in the Bowery King (Laurence Fishburne) who is an outsider but also lives by the same code of the underworld. Chad Stahelski’s direction is definitely stylish in its approach to the violence and action while it has a fluidity that harkens to martial arts and samurai films of the past. Shot on location in New York City and Rome, Italy with additional locations in Montreal, Stahelski opens the film with a car chase in New York City as it establishes what Wick is doing and what he wants where it sort of picks up where the previous film left off. While there are some wide shots of the different locations in the film including some unique compositions in some of the meetings and violent moments in some elaborate sequences. Stahelski knows when to slow things down as it relates to the story and what is going on through simple compositions in the close-ups and medium shots as well as the fact that Wick is still coping with the loss of his wife Helen (Bridget Moynahan) some years ago. Stahelski’s approach to set-pieces and how to create moments of suspense are key to the action as he prefers to take its time rather than just go all-in and heighten the action even more following an action sequence. Most notably a scene in which Wick faces off with Cassian in a New York City subway train where they both look at each other and they’re stuck in a crowd of people but rather than try to kill each other. They bide their time so that people can leave as neither man is interested in killing innocent people which showcases this rare sense of humanity that these two men have which is often lacking in action films. The stakes are also bigger for the film’s third act as it relates to Wick being this target and what D’Antonio is trying to do. Its climax is definitely inventive and stylish in its compositions and choreography with an aftermath that is about this air of uncertainty for Wick. Overall, Stahelski crafts a thrilling and intense film about a hitman being lured back into the criminal underworld. Cinematographer Dan Laustsen does brilliant work with the film’s stylish cinematography with its usage of stylish lights and colors for some of the scenes including the Roman caverns and lights at night in Rome as well as some of the locations in New York City. Editor Evan Schiff does excellent work with the editing as it is very stylish with its fast-cuts to play into the action but knows when to slow things down and not deviate into chaotic fast-cutting styles. Production designer Kevin Kavanaugh, with set decorators Letizia Santucci and David Schlesinger plus supervising art directors Isabelle Guay and Cristina Onori, does fantastic work with the look of the sets in Italy as well as the sets of the Continental hotel lobbies in Rome and New York City as well as the museum for the film’s climax. Costume designer Luca Mosca does amazing work with the costumes from the design of the suits that Wick wears as well as some of the clothes of the other characters. Visual effects supervisor Paul Linden does nice work with the visual effects as it is largely low-key as set-dressing for some of the locations as well as for some of the film’s action sequences. Sound editor Mark P. Stoeckinger does superb work with the sound as it play into the atmosphere of the locations as well as how gunfire and knives sound. The film’s music by Tyler Bates and Joel J. Richard is wonderful for its mixture of electronic, rock, and orchestral music that play into the suspense and action while music supervisor John Houlihan create a soundtrack that is a mixture of rock and electronic music that includes a cut from Jerry Cantrell of Alice in Chains. The casting by Jessica Kelly and Suzanne Smith is great as it feature some notable small roles and appearances from Bridget Monyahan as Wick’s wife Helen via flashbacks, Peter Stormare as a mob boss whom Wick confronts early in the film, Tobias Segal as a homeless hitman, Peter Serafinowicz as a tailor for the Continental, John Leguizamo as Wick’s friend Aurelio who owns a chop shop, Thomas Sadoski as a policeman friend of Wick in Jimmy, Lance Reddick as the concierge for the New York City Continental hotel in Charon, Franco Nero as the manager of the Continental hotel in Rome, and Claudia Gerini as Santino’s sister Gianna who has a seat in the high council of crime lords. Ian McShane is excellent as the New York City Continental hotel manager Winston who is a longtime friend of Wick that warns him about some of the consequences of what Wick would do. Ruby Rose is fantastic in a silent role as Santino’s mute bodyguard Ares as a woman that communicates through sign language as she is this ambiguous figure who is very deadly in the way she is willing to protect Santino. Common is brilliant as Cassius as a bodyguard for a high council official who also knows Wick as he shares an equal amount of respect for him in the way they do business as well as trying to kill him but with a sense of honor. 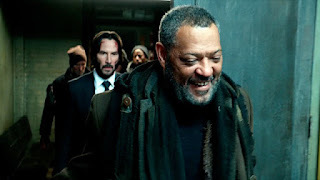 Laurence Fishburne is amazing as the Bowery King as a crime boss who is part of an underground crime syndicate as he helps Wick in dealing with Santino as well as knowing about what is happening to Wick. Riccardo Scamarcio is superb as Santino D’Antonio as a crime lord that wants Wick to do an assignment by using a sacred code in the hopes he can get a seat at a high council and rule New York City for his own reasons. Finally, there’s Keanu Reeves in a phenomenal performance as the titular character as a man trying to move away from the world of crime only to be lured back because of a blood oath that he can’t refuse where he deals with the task he’s given as well as cope with the loss of his wife and home where Reeves display that restraint in his anguish while knowing that Wick is headed for uncertainty. John Wick: Chapter 2 is a sensational film from Chad Stahelski that features another incredible performance from Keanu Reeves. Along with its supporting cast, dazzling visuals, and a gripping music score, it’s an action film that manages to do more than expected with its story of vengeance as well as what a man is forced to do when he’s lured back into the world of crime. In the end, John Wick: Chapter 2 is a riveting film from Chad Stahelski. This movie is so much fun and easily contains some of the year's best action sequences. Glad you liked it! @Wendell-Thank you. It's one of those films where you don't need to take things so seriously yet it has something that is often lacking in a lot of action films which is the need to take its time and have characters display some humanity. I love the fights between Keanu and Common as you could tell they approached it with a sense of honor like in the old samurai movies. I want more of that.